Secure access to a building is paramount for all people to avoid unwanted guests, cold callers or theft. The Green Access IP door entry system is a standalone entity that allows visitors to call a flat through an entrance panel at the main door. This sends the call to a handset in the flat, which in turn can release the door and allow entry. The IP systems offer an intelligent infrastructure – either on UDP or SIP – that promotes a strong and secure backbone and offers maximum control, flexibility and scalability of your systems. You will have the peace of mind that our solutions can support the most at-risk projects across all market sectors. If security and reliability are important to you, contact Green Access for a tailor-made solution. A door entry system is required in almost all high rises and low rise blocks of flats and commercial units, this is due to the ever growing requirement to offer secured by design solutions for residents. The door entry system will allow the residents to live with peace of mind, knowing that the only people entering the properties communal areas are the people that are supposed to be there. In commercial developments, the Green Access door entry system would allow for a single reception area to monitor the visitors for all companies located within the premises. With the ability of call forwarding by utilising an SIP server, the receptionist is able to not only confirm who the visitor is themselves but also transfer the call to the relevant person. This is also relevant in large single occupancy businesses that wish to restrict people from entering the building but still allow their workers full access via their access control systems. Green Access’ door entry systems are a true end to end IP solution that can utilise both SIP and UDP communication without the requirement of a server (depending on system requirements i.e. call routing). The Green Access door entry system can be designed to suit bespoke solutions such as those that require a certain type of entrance panel (Bronze, extra-large etc..), as well as being able to customise our display on our G9 monitors with bespoke options and logos. Depending on system requirements (for example we have previously added a custom phone book and an “I’m OK” function on customer request), the Green Access door entry system can be highly flexible. The GA Door entry system consists of IP end to end products; this means that they only require a suitable network infrastructure following the IEEE standards to work. Each device can be addressed either as an SIP device or by using our proprietary addressing system, which allows the system to work with or without a server (the server adds additional features and benefits). Green Access offers a variety of internal and external devices for the door entry system, this includes internal monitors ranging from 4”, 7” and 10” options, each device offering their own unique solutions with the added options of black or white casing. Our internal devices are fully POE compatible, whether this is with an additional POE splitter (i2) or an inbuilt feature into the unit (G9). 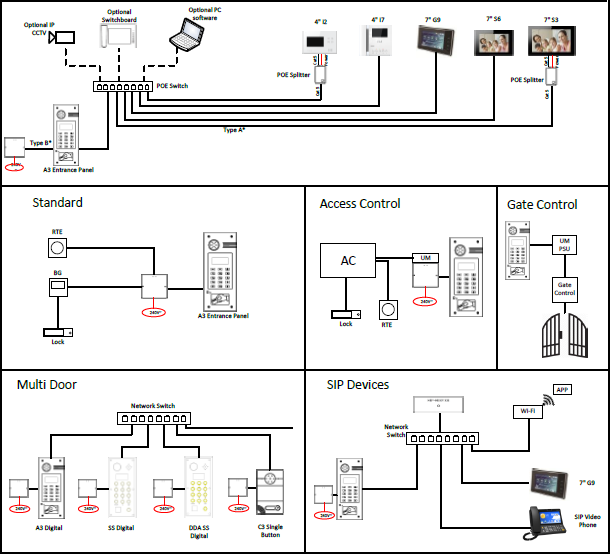 If you decide you would like to integrate an SIP server into your Green Access door entry system, we can offer the additional benefit of custom software, SIP extension addressing and the facility to work alongside other 3rd party SIP devices. This means we do not tie you into working purely with Green Access products.